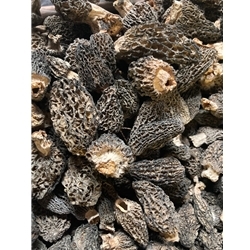 These morels are a mix of mainly greys, with a few blacks and naturals. They are large enough to stuff. There are approximately 10 morels per 1/4 lb. The range from 2 1/2 inches in length and 1 inch around (dried) to much larger. I love these morel's in gravy, buttered with garlic, and defried in oil with and egg and flour batter. I grew up in Michigan and used to hunt my own, but out here in Utah i do not know where to go. My hunger for these wonderful and favorful Morels was finally filled! I cooked my first in butter with garlic and chopped green onions. I added some large shrimp to the mix. Fantastic! Now I will probably want more before the year is out! I grew up near Seattle and miss them so much.